1La Libertad Research Center, Corporación Colombiana de Investigación Agropecuaria (Corpoica). Villavicencio (Colombia). 2Agro-Industrial, Livestock and Tourist Technological Complex, Servicio Nacional de Aprendizaje (Sena). Apartado (Colombia). 4Department of Biological Systems Engineering and Horticultural Crops Research Unit, USD A. Washington State University. Pullman, WA (USA). Received for publication: 25 February, 2013. Accepted for publication: 1 November, 2013. Growing plants in substrates is an alternative for the production of roses under unfavorable soil conditions. The objective of this study was to determine the biomass distribution efficiency of rose cv. Charlotte grown in soil and substrates under greenhouse conditions until second production peak. In this trial, soil and substrates with 100% burned rice husk (100BR H); 65% burned rice husk: 35% coconut fiber (65BR H); 35% burned rice husk: 65% coconut fiber (35BR H); and 100% coconut fiber (100CF) were used. The experimental design consisted of a randomized complete block design with three repetitions. Destructive sampling was carried out using whole plants and flowering stems at previously determined bud stages. Leaf area and dry matter in organs were measured and growth rate and physiological indexes were calculated. The assessed variables were fitted to logistic and exponential models. The plants grown in substrates with BR H (burned rice husk) showed similar values regarding dry matter and fresh weight accumulation in organs. Plants in the soil treatment were the last ones to reach the different development stages of the flowering buds, while those that were grown in 100CF were the first ones. The treatments 35BR H and 100CF showed less growth of flowering stems, which was expressed in terms of relative dry matter increase per day. The plants grown in soil showed more dry matter in leaves and stems but less in flower buds. The 65BR H treatment showed some of the highest dry matter accumulations in leaves, stems and flower buds and also showed the highest leaf area ratio, leaf weight ratio, and specific leaf area values. Key words: dry matter partition, growth analysis, coconut fiber and rice husk. El cultivo en sustrato es una alternativa a condiciones desfavorables del suelo para la producción de rosas. El objetivo del estudio fue determinar la eficiencia de la distribución de biomasa en rosa cv. Charlotte cultivada a segundo pico de cosecha en suelo y en sustrato, en condiciones de invernadero. Para el ensayo se utilizó suelo y los sustratos 100% cascarilla de arroz quemada (100CAQ); 65% cascarilla de arroz quemada: 35% fibra de coco (65CAQ); 35% cascarilla de arroz quemada: 65% fibra de coco (35CAQ); y 100% fibra de coco (100FC). El diseño fue en bloques completos al azar con tres repeticiones. Se realizaron muestreos destructivos utilizando plantas completas y tallos florales en estadios del botón previamente determinados. Se midió área foliar y masa seca por órganos y se calcularon índices y tasas de crecimiento. Las variables evaluadas se ajustaron a los modelos de crecimiento logístico y exponencial. Las plantas cultivadas en los sustratos con CAQ mostraron valores similares en cuanto a la acumulación de masa seca y fresca por órganos. Para alcanzar los estadios de desarrollo del botón floral, las plantas del tratamiento suelo fueron más tardías y las cultivadas en 100FC más precoces. En 35CAQ y 100FC se presentó un menor crecimiento de los tallos florales, expresado en términos de aumento relativo de masa seca por día. Las plantas en suelo presentaron más masa seca en hojas y en tallo, pero menos en botón floral. El tratamiento 65CAQ estuvo entre los mayores acumulados de masa seca foliar, del tallo y del botón floral, se mantuvo entre los mayores valores de relación de área foliar, relación de masas foliar y área foliar especifica. Palabras clave: partición de masa seca, análisis de crecimiento, fibra de coco y cascarilla de arroz. Since 1950, soil has been replaced by substrates in order to avoid the negative impact caused by pests and soil diseases. By substituting a heavy and hard to clean media with a light, easy to wash and recyclable material, it is possible to guarantee a clean, neutral and aired environment for roots (Kehdi, 1995; Cabrera, 2002; Cadahía, 2005). 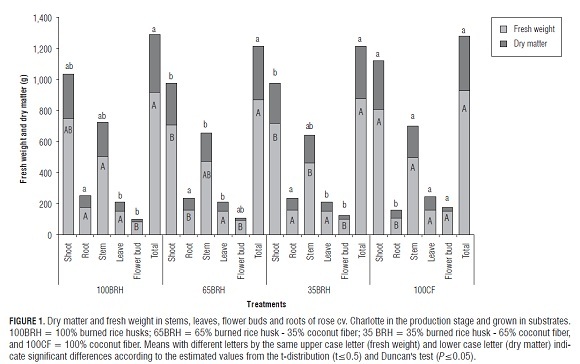 In Colombia, soilless plantations of ornamental species are open systems that use burned rice husk as a main substrate, which is an organic material with neutral pH, low EC and CEC and rich in potassium and phosphorus and poor in nitrogen (Burés, 1997; Pire and Pereira, 2003), but it is also light weight with a low decomposition rate, highly permeable, and highly porous with good aeration. As it does not preserve humidity evenly it is necessary to mix it with other materials such as coconut fiber (Cabrera, 2002; Samartzidis et al., 2005). Coconut fiber has a higher physical stability and lower apparent density than peat, high porosity (95%), high aeration (40%), CEC between 100-150 meq/100 g and pH of 6.0 (Galán, 2004). The area cultivated with roses in substrate on the Bogota Plateau has been increasing during the last decade. According to producers, this system, compared with the traditional cropping system in soil, offers advantages such as precocity in the formation of plants and the production of flowering stems as well as increases in productivity and, in some cases, also quality. However, local studies aiming to establish how biomass is directed in rose plants cultivated in cropping systems with organic substrates have not been conducted. The dry matter accumulation over time in plants can be represented by a sigmoid growth curve (Salisbury and Ross, 2000). The objective of the present study was to determine the biomass distribution efficiency of roses (Rosa sp.) cv. Charlotte in plants grown in substrates consisting of burned rice husk and coconut fiber at the second harvest peak, as compared with the traditional cropping system in soil. This trial was conducted in the municipality of Mosquera (Colombia), which is located at 2,516 m a.s.l., with a mean temperature of 12.6°C and annual precipitation of 670 mm. A traditional wooden greenhouse module of 2,210 m2, with five 6.8 x 65 m sections (442 m2), lateral and zenithal passive ventilation, was used. Rose plants of cv. Charlotte grafted on "Natal Briar" stock were used. The plants were grown on beds on which pots were filled with both soil and the following substrates: 100% burned rice husk (100BR H), 65% burned rice husk - 35% coconut fiber (65BR H), 35% burned rice husk - 65% coconut fiber (35BR H) and 100% coconut fiber (100CF). The rice husk used had a burn degree of over 80%. Two plants were sown in each 8 L pot and placed on suspended 30 m-long beds. The distance between the plants was 0.16 m, providing an approximate plant density of 7 plants/m, for a total of 13,797 plants in the greenhouse. Destructive sampling was carried out, one for whole plants at the moment of cutting the flowering stems and another for flowering stems at different development stages of the flowering buds. Leaf area and dry matter were the variables assessed in the following organs: Stems, leaves and flower buds, which were obtained at 105°C over 72 h; additionally, fresh weight and dry matter of roots was measured. The curves of the assessed variables at the different stages of flower bud development were fitted to logistic and exponential models, which are described in equations 1 and 2, respectively (Hunt, 1982; Seber and Wild, 1989). The following indexes and growth rates were calculated according to the description given by Flórez et al. (2006): leaf area ratio (LAR), specific leaf area (SLA), leaf weight ratio (LWR), relative growth rate (RGR) and net assimilation rate (NAR). Where α = maximum variable value, k = constant between 0 and 1 that determines the slope of the curve, g = time of highest absolute growth rate (AGR), and x = time in days after sprouting of flower buds (DS FB). Where K = constant between 0 and 1 that determines the slope of the curve, y = time of highest absolute growth rate (AGR), and x = time in days after sprouting of flower buds (DS FB). The experimental design consisted of a completely randomized block design with 100BR H, 65BR H, and 35BR H as treatments, using a 30 m2 bed as the experimental unit, with the treatments in soil and 100CF placed outside the design. In both cases, three repetitions were applied. In the destructive sampling of pot plants, three randomly selected plants per bed were evaluated, resulting in 27 plants for the treatments with CAQ and 9 plants for the 100CF treatment. For the destructive sampling at the different stages of the flower buds (Cáceres and Nieto, 2003): rice size (in Spanish arroz), double rice size (doble arroz), pea size (arveja), chickpea size (garbanzo), breaking of color (rayar rojo) and cutting point (punto de corte), five stems per repetition were randomly chosen; that is, 165 flowering stems per stage for a total of 990 evaluated stems. The data obtained from the studied variables were analyzed using the SAS® program v. 9.1 (SAS Institute, Cary, NC ). The statistical difference between treatments of the completely randomized block design was determined using Duncan's comparison test; the soil and 100CF treatments were analyzed using GLM Anova and a t-distribution test was used for unequal variances. The variables leaf area and dry matter of leaves, flower stems and total dry matter were fitted to a logistic model while the variable dry matter of flower buds was adjusted to an exponential model. Although plants grown in treatments 100BR H and 65BR H showed a higher leaf area value, no significant statistical differences were found between treatments (data not shown). On the other hand, as shown on Fig.1, the dry matter of leaves in plants grown in treatment 100CF was significantly higher than in the other treatments. The fresh weight of flowering stems in treatments 100CF and 100BR H was also significantly higher than in treatment 35BR H; and the dry matter of treatment 100CF showed a higher value than treatment 65BR H. The fresh weight and dry matter accumulation in flower buds of plants in treatment 100CF were statistically higher than in plants grown in treatments 100BR H and 35BR H; while the dry matter in treatment 100CF was not significantly different from that in plants in treatment 65BR H. In general, plants grown in substrates with BR H contents showed similar fresh weight and dry matter accumulation values in organs (Fig.1). The fresh weight and dry matter accumulation in the roots showed a slight decreasing trend as the FC content increased (Fig.1). In this regard, Pérez et al. (2005), while evaluating substrates in strawberry crops, found a negative trend in relation to growth and matter accumulation in certain organs as the coconut fiber content increased in the substrates. Plants grown in treatment 100CF showed lower dry matter accumulation in the roots but higher accumulation in the flowering stems, as compared with the other treatments. This differs from the growth evaluations performed by Farías et al. (2005) in the same type of rose plants as this study at the first production peak as they found that, by using coconut fiber (CF), there was a higher biomass gain in roots and a lower one in stems. The dry matter of flower buds of plants in treatment 100CF was higher than in the rest of the treatments. Therefore, reproductive growth was favored in relation to vegetative growth. Taking into account the variable of equatorial diameter of flower bud, Tab.1 shows the mean values in days needed for the flowering stems of each treatment to reach the different phenological development stages, as proposed by Cáceres and Nieto (2003). Plants in the treatment with soil reached these stages later than the other treatments and the plants grown in treatment 100CF were the first to reach them. The ranges between stages, expressed in days, are shown in the following way (Tab.1): From rice size to double rice size, 2 to 5 d; from double rice size to pea size, 5 to 7 d; from pea size to chickpea size, 3 to 8 d; from chickpea size to breaking of color, 5 to 9 d, and from breaking of color to cutting point, 9 to 13 d.
The higher leaf area absolute growth rates (AGR) reached a range of 30.7 to 60.1 cm2 d-1 (Fig.2), corresponding to the treatments Soil and 65BR H, respectively. These correspond to the phenological stages of double rice size and pea size, according to the days after sprouting of leaf sprouts (DS FB) (Tab.1). 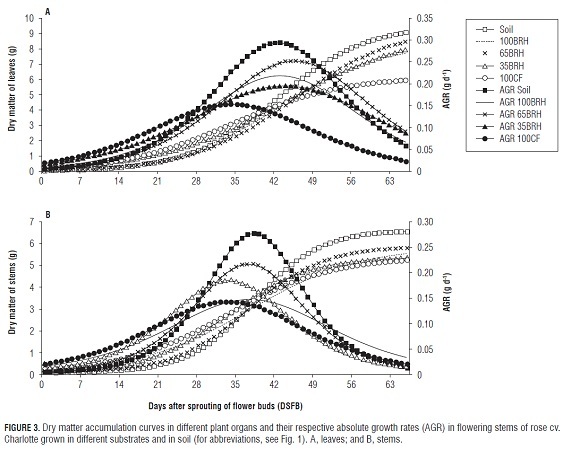 The flower stems of plants grown in soil increased their leaf area between 4 and 63 DS FB, while the other treatments increased it between 14 and 56 DS FB (Fig.2). Table 2 shows the estimated values of parameters a (maximum value of the variable), ? (constant that determines the slope of the curve), and g (time of highest absolute growth rate) for this variable. The estimated value for a of the flowering grown in Soil was significantly higher than in plants grown in treatments 100BR H and 35BR H. For ?, the highest value was confirmed in treatment 65BR H, which was significantly higher than in the treatment Soil. For parameter g, significantly higher values were achieved in the flowering stems of plants grown in Soil and treatment 65BR H in relation to plants of treatments 100CF and 35BR H, while treatment 100BR H showed intermediate values. The dry matter of leaves in the flowering stems of plants grown in Soil and treatment 65BR H showed a maximum a of 9.6 and 9.4 g, respectively, whereas, with the exception of treatment 35BR H, the plants in treatment 100CF accumulated significantly less biomass and reached their maximum AGR in the shortest amount of time and lowest value in relation to the other treatments (Fig.3A and Tab.2). These maximum AGRs were located near the Chickpea stage in flowering stems of treatments 100BR H, 65BR H, 35BR H and Soil, while for treatment 100CF, the maximum value was between the Double rice stage and the Pea stage (Fig.3A and Tab.1). In this regard, Farías et al. (2005) did not find significant differences at the first production peak for this same crop, but it is worth noticing that, contrary to the findings of this study, the plants grown in Soil showed a lower dry matter content in leaves than the plants of treatment 100CF. The plants grown in Soil accumulated significantly more dry matter in the flowering stems (a) than the plants in treatment 35BR H, while the rest of the treatments showed an intermediate behavior without significant statistical differences between them (Tab.2). The difference between the treatments Soil and 35BR H was possibly due to the fact that the flowering stems of plants in treatment 35BR H reached their maximum AGR markedly earlier (parameter g) than those grown in Soil (Tab.2 and Fig.3B). In the flowering stems of plants grown in Soil, the estimated value of dry matter of flower buds (parameter ?) was statistically lower than that of flower buds in substrates containing BR H (Tab.3). By means of Fig.4 it is possible to verify that the highest dry matter accumulation in the flower buds occurred in plants of treatment 65BR H, which in all the treatments corresponded to the phenological stage of breaking of color. However, the plants established in treatment 100CF reached the maximum AGR significantly earlier than plants in treatments 100BR H, 65BR H and in Soil (Fig.4 and Tab.3). TTable 2 and Fig.5 show that for flowering stems of plants established in treatment 65BR H the total dry matter accumulation and the time of the highest AGR (47.2 DS FB) were significantly higher in relation to plants in treatment 100CF (38.6 DS FB). The stages of highest dry matter accumulation occurred during the transition from the Chickpea stage to the Breaking of color stage for plants in reatments 100BR H, 65BR H, and 35BR H, while for the treatments 100CF and Soil, they occurred during the transition from the Pea stage to the Chickpea stage. In treatment 100CF, a decrease in dry matter of leaves and total dry matter of flowering stems was observed between the first and second production peaks in relation to the rest of the treatments. This was probably due to the stress conditions caused by the accumulation of salts in the substrate, as a function of the characteristics inherent in the material and management practices used. The flowering stems in substrate 100CF showed lower leaf area and, except for the plants in treatment 35BR H, the dry matter of leaves was significantly lower. This reaction can possibly be associated with the accumulation of salts, which was reported by Galán (2004). At the end of the cycle, the plants in the treatment with Soil accumulated more biomass in flowering stems and leaves; they also showed a higher leaf area. However, they directed a lower amount of dry matter to the flower buds. Meanwhile, a lower amount of leaf dry matter and total dry matter was achieved in treatment 100CF. This was possibly a result of the stomata remaining closed for a longer time. Plants subjected to water stress close their stomata in order to diminish water loss, but CO2 collection is reduced (Traveria, 1998). For the variables dry matter of leaves, stems and total dry matter, delayed maximum AGRs result in desirable maximum values of the variable. On the other hand, early maximum AGRs for dry matter of flower buds would probably affect the opportunity of directing carbohydrates as well as the flower bud filling efficiency positively. Flowering stems of plants established in the treatment Soil showed lower leaf area exposition in relation to total weight (Fig.6A). However, they displayed the highest leaf expansion until 28 DS FB, time of maximum LAR value (74.4 cm2 g-1). At 35 DS FB, maximum LAR values were reached in flowering stems in treatments 100CF and 35BR H and, in treatments: 100BR H and 65BR H, these were reached at 38 DS FB. 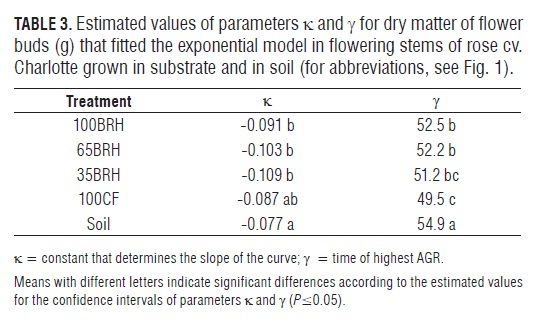 From that moment on, the LAR values decrease, the production of leaves ceases and leaf area growth per flowering stem slows down (Fig.3A) due to the fact that dry matter is directed increasingly to other plant organs. For flowering stems of plants grown in substrate, the SLA showed a similar trend during the entire cycle. However, in the treatment Soil, the maximum SLA was reached earlier (28 DS FB), during which they accumulated more dry matter per unit area (Fig.6B). Between 28 and 38 DS FB, the highest SLA values were observed in all the treatments when the leaves became more crowded. This period coincides with the onset of photoassimilate translocation to the rest of the structures of the flowering stem, in particular, to the stems and flower buds (Figs. 3B and 4). As observed in Fig.6C, during the first 42 DS FB, the LWR curves of the flowering stems in the different treatments showed contrasting trends: decreasing in the treatment Soil, increasing in treatments 65BR H and 100BR H, and remaining constant in treatments 100CF and 35BR H. From this point on, the curves of all the treatments showed a trend towards stabilizing due to the formation of the flower buds (Fig.4), which was reflected in the increase in total dry matter in flowering stems (Fig.5). The tendency of treatments 65BR H and 100BR H indicates an increase in the fraction of dry matter in leaves, which could be explained by the behavior of SLA until 35 DS FB (Fig.6B). Treatment 65BR H showed one of the highest accumulations of dry matter in leaves, stems and total (Tab.2); it also showed some of the highest values of LAR, LWR and SLA. Considering this, the flowering stems of this treatment would be more efficient in the use of photoassimilates. For these indexes, the highest values in the treatment Soil were observed during the first 28 DS FB. Thicker leaves have a higher photosynthetic activity because they contain a higher amount of chlorophyll per unit leaf area (Craufurd et al., 1999). 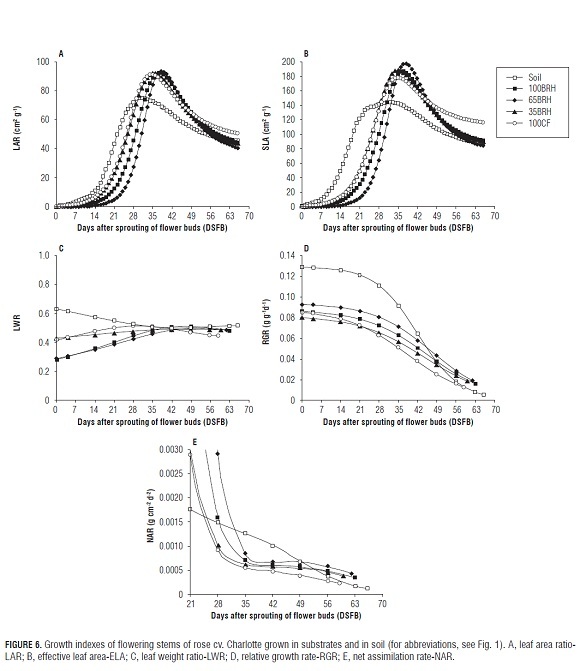 In general, Fig.6D shows that the curves for this rate in all the treatments tend to decrease until the moment of cutting the flowering stems. At 21 DS FB, the decrease in the curves became accentuated, which coincides with the dry matter increases in the stems, leaves and in total dry matter (Figs. 3 and 5). In the treatments Soil and 100CF, this tendency became more evident. Until 42 DS FB, which is the transition point between the Chickpea stage and the Breaking of color stage Tab.1), the flowering stems of the treatment Soil proved to be more efficient in producing new material, which could explain the maximum SLA and LWR values until 28 DS FB (FigS.6B and 6C). Flowering stems of plants established in substrate showed a similar trend regarding RGR during the production peak, with lower values in treatments 100CF and 35BR H. This could be explained by a significantly lower dry matter accumulation in stems and leaves of plants in treatments 35BR H and 100CF, respectively (Tab.2). Thus, these treatments showed the smallest growth of flowering stems, which was expressed in terms of relative dry matter increase per day (Fig.6D). The trend observed in RGR (Fig.6D) agrees with the statements of Blackman (1968), Tekalign and Hammes (2005) as well as Flórez et al. (2006) on the temporary changes in this rate, which means that RGR is higher during the vegetative phase of the plants and decreases at the moment of reaching maturity and maximum AGR in the leaves. The curves decrease with the development of flowering stems due to shadowing and aging of the lower leaves. As expected, NAR in all the treatments tended to decrease, from the beginning of the evaluation to the moment of cutting the flowering stems. However, in the treatment Soil, it was constant during the cycle, while, in the other treatments, it was more accentuated until 35 DS FB. This behavior is a normal result of the development of flowering stems in plants (Hunt, 1978; Flórez et al., 2006). During the first weeks, the capacity of leaves to intercept radiation is higher, which is reflected in the NAR. In all the treatments, the maximum NAR values were observed during the first 28 DS FB. Between 35 and 52 DS FB, the flowering stems in treatments with substrates containing BR H showed a similar behavior. During this period, the production of new leaves ceased and the number of true leaves became constant (data not shown); the AGR of the leaf area showed a tendency towards zero in the flowering stems of plants grown in substrate, while it continued to increase in those grown in Soil (Fig.2). From 52 DS FB, the NAR curve decreased, coinciding with the phenological stage of Breaking of color. During the period of this study, the values in treatment 100CF were lower, indicating lower photosynthetic efficiency per unit leaf area (Fig.6E). Flowering stems of plants grown in treatment 100CF showed lower biomass accumulation in leaves and in the whole flowering stem in relation to the treatment Soil, which was probably caused by the salinity conditions of substrate 100CF. The increase in salt concentration could cause water stress and, by affecting the availability of water and nutrients, the photosynthetic rate becomes altered, reducing growth and accumulation as well as the biomass distribution pattern and plant productivity as a result (Samartzidis et al., 2005). According to Abid et al. (2001), increasing the EC reduced length and fresh weight in maize plants. RGR and NAR show a positive correlation and decrease when EC, aluminum saturation and plant age increase. In rice plants of cv. IRR 6 RGR decreases during flowering. At harvest point, plants established in substrate 100CF showed lower dry matter accumulation in roots and a higher accumulation in leaves tend to show higher dry matter contents in stems and flower buds. However, this variable, when measured on flowering stems, showed lower total biomass accumulation values, as well as in leaves of plants grown in treatments 100CF. For leaf area of flowering stems, the lowest AGR was reached in the treatment Soil, but this same treatment showed the maximum value for this variable at the end. This occurred as a result of the smaller slope of the curve and a late maximum AGR value. However, the most efficient treatment regarding this variable was 65BR H.
The plants in the treatment Soil were the last to reach the different development stages of flower buds, while the first ones where grown in treatment 100CF. A lower growth of flowering stems, expressed as the relative increase in dry matter per day, was observed in treatments 35BR H and 100CF, which was explained by a lower dry matter accumulation in the leaves and stems. Plants grown in the treatment Soil showed more dry matter in the leaves and stems but less in the flower buds. Meanwhile, treatment 65BR H showed some of the highest accumulations of dry matter in leaves, stems and flower buds, explaining why it also showed the highest total dry matter accumulation. As a result, the flowering stems were able to maintain some of the highest values of LAR, LWR and SLA. Thus, they would be the most efficient in the use of photoassimilates. The authors express their gratitude to the Centro de Biotecnología Agropecuaria of SEN A (SENA's Biotechnology, Agricultural and Livestock Center), Asocolflores and to the Facultad de Ciencias Agrarias at the Universidad Nacional de Colombia (Faculty of Agricultural Sciencies at the National University of Colombia) in Bogota, which were the financing institutions of the project "Producción más limpia de rosa (Rosa sp.) y clavel (Dianthus caryophyllus L.) con dos técnicas de cultivo sin suelo en la Sabana de Bogotá"(Cleaner rose (Rosa spp.) and carnation (Dianthus caryophyllus L.) production using two Soilless cultivation methods on the Bogota Plateau), in which the present study was carried out.